Abbot Fire Group, working in partnership with Everlux, have successfully completed an installation of low level lighting (LLL) for Hightown Housing Association. Based in nearby Hemel Hempstead, Hightown chose Everlux as the supplier for their LLL requirements having seen a demonstration at the International Firex exhibition earlier this year. 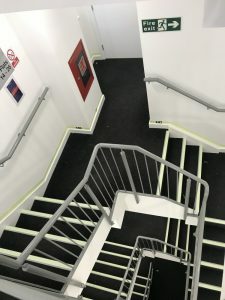 The project required Abbot Fire Group to fit low level lighting in three buildings managed by Hightown Housing Association. 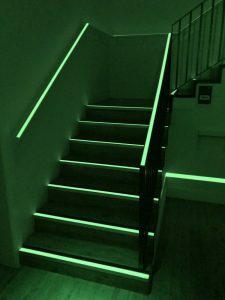 A total of 1.72 km of low level lighting strips were fitted, along with 404 steps. These were fitted across the three buildings: Beaton Court, Bailey Court, and Hosking Court. In the event of a fire in a building, smoke will rise. Therefore this can sometimes obscure the emergency lighting which is often situated above a door, or on the ceiling. Low level lighting provides clear guidance of the exit routes when emergency lighting is dimmed by smoke build up. The general advice if you’re evacuating a smoke filled area, is to drop to your knees and crawl out of the area. By doing this you can have a clearer visual of the escape route, and the air can be cleaner. With low level lighting your escape route is easily identified. 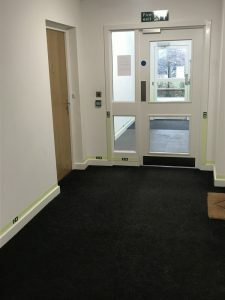 LLL is cost effective to install, and easy to maintain; it can simply be wiped down with a cloth. 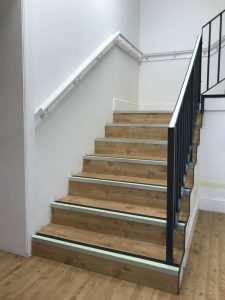 Abbot Fire Group’s team of LLL installation experts, working with reliable products supplied by Everlux, can install your low level lighting. This ensures your escape routes are clearly highlighted in the unfortunate event of a fire. Abbot Fire Group can install low level lighting nationwide, for further details, just call 01280 824111, or email.